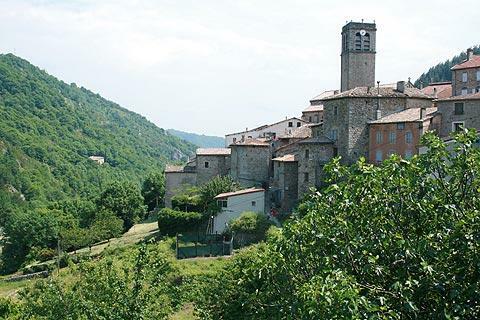 Antraigues is a medieval perched village located about 15 kilometres north of Aubenas and is one of the listed 'villages of character' to be found in Ardeche department. The approach from Aubenas passes through Vals-les-Bains then rapidly climbs into a very attractive valley until suddenly the village appears ahead of you, perched on top of a hill above the Volane and Bise rivers which meet in the valley below the village. France This Way comment: although it is a small village it is well worth the effort to visit Antraigues-sur-Volane both for the village itself, which in 2014 was voted one of the 'favourite villages of the French', and for the lovely Ardeche scenery around the village. At the point where the village of Antraigues-sur-Volane first comes into sight there is space for a couple of cars to park, and a footpath that runs up to the village - a nice way to arrive. Alternatively there is parking available in the village itself if it is hot and you don't feel like climbing a hill! 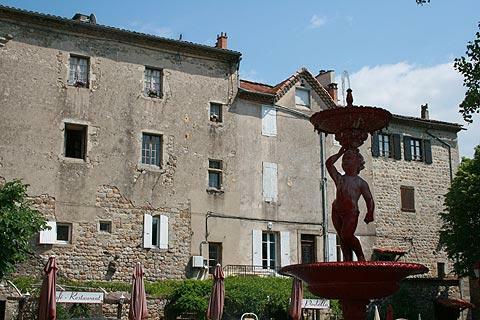 The centre of the village is based around a large open square with shady trees, a fountain and a sprinkling of cafes. 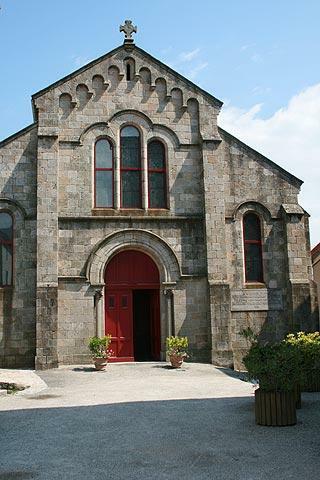 There are also several streets running off from the main square and down the hill which you will enjoy exploring, in particular those around the church. These often have fleeting attractive views of the surrounding hills and countryside between the ancient granite buildings. The Chapel of Saint-Roch can be seen here, and a tower that stands above the village (now the church belltower, and originally the keep for the medieval castle that once stood here). Antraigues also has a small supermarket and a couple of other 'practical' shops, useful if you are staying in the region. The village also has a reputation for the number of artists that live nearby, and frequent exhibitions are held of works by local painters in Antraigues-sur-Volane. Close to the village you can explore the pretty river valley, see the cascade de espossard and also see an unusual rock formation called the Rocher du Fromage - formed from basaltic columns, as well as the cliffs and steep valleys that surround Antraigues-sur-Volane. 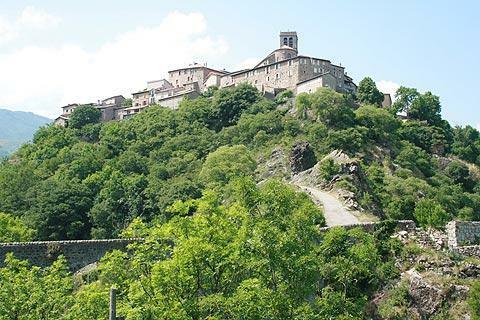 A little further and you can visit several other Ardeche villages of character such as Meyrat, Thueyts and Jaujac, and there are numerous opportunities to enjoy the countryside of the Natural Regional Parc of the Monts d'Ardeche which surround Antraigues.